A portion of the proceeds will benefit the International Agency for Research on Cancer (IARC), an agency of the World Health Organization dedicated to the science of cancer and promoting international collaboration in cancer research. 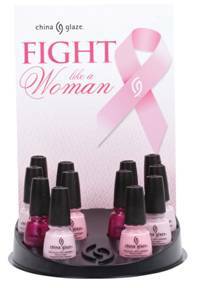 The “Fight Like A Woman” Collection will be available at professional beauty supply stores and select salons this September. Availability will be very limited internationally. · Zombie Zest: A mossy green shade with gold flecks of micro glitter. · Ick-A-Body: A dark green base chock full of orange glitter. · Mummy May I: Vampy, wine colored purple with flecks of hot pink glitter. The 18 piece display will be available at Sally’s Beauty Supply Stores only and the 4 piece with free Fast Forward Top Coat will be available at all other beauty and nail supply outlets, stores and e-tailers. OPI Shrek Collection: Who the Shrek Are You? OPI Shrek Collection: What's With the Cattitude?